President Barack Obama has overseen a resurgence in U.S. oil and gas production on both private and public lands. Under his watch, oil production on federal lands was higher every year from 2009 through 2011 than it was from 2006 through 2008. 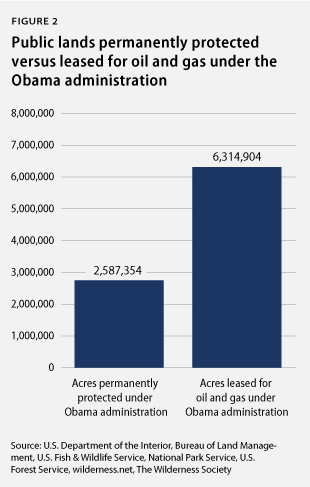 In 2011 the Bureau of Land Management held three of its five largest-ever lease sales for the rights to drill on public land for oil and gas. And as the president said himself, “we are drilling all over the place”—in fact, the United States is expected to become the world’s largest crude oil producer by 2020, according to the International Energy Agency. But the Obama administration has significantly more work to do when it comes to balancing energy development and land conservation on our public lands. The president has begun to establish his conservation legacy, in ways such as removing the threat of uranium mining around the Grand Canyon for 20 years, establishing four new national monuments, and fighting for conservation funding. Nevertheless, his efforts fall far short when it comes to permanently protecting public lands for their economic, scenic, and environmental values. Protecting public lands means restricting drilling, mining, and other industrial activities that can take place on them, and can be accomplished either by bills passed in Congress or actions taken by a president and his administration under their authorities. The president’s shortcomings in permanently protecting public lands are particularly clear when his conservation accomplishments are compared to those of previous presidents. 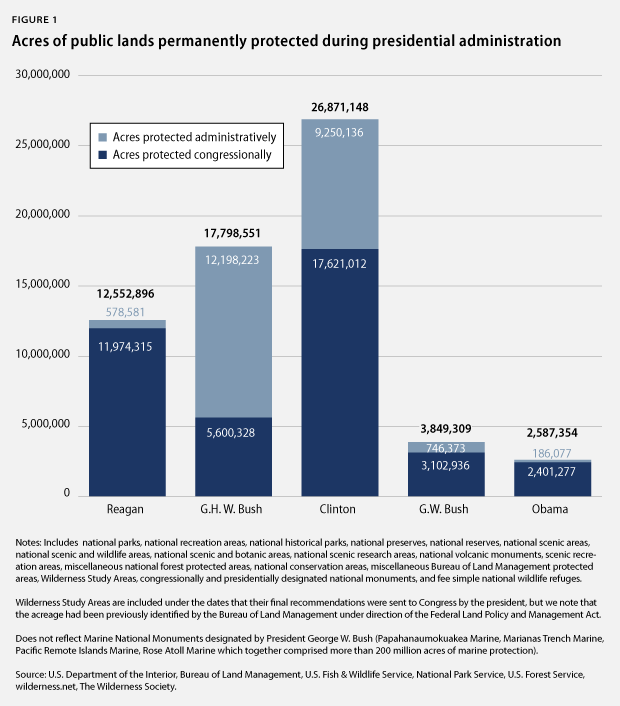 As seen in the graph below, just 2.6 million acres of public lands have been permanently protected during the Obama administration by both the president and Congress. Of this total, 186,000 acres were protected by the president using administrative authorities. The number of acres protected over the last four years is far fewer than under President Obama’s four predecessors, including even President George W. Bush, who was condemned by environmentalists and the public for his dismal environmental record. The graph above includes federal public lands that have been permanently protected by Congress or the president. “Permanently protected” lands are defined here as those lands that would require an act of Congress to change their designation and/or level of protection—such as national parks, national monuments, wilderness areas, and many others. Areas that have been just temporarily protected—such as the 20-year withdrawal of 1 million acres around the Grand Canyon from mining—are also not included. Similarly, congressional mineral withdrawals are not included as they offer protection only from mineral extraction. And finally, only federal public lands are incorporated, so places like national wildlife refuges that have been created through easements on private property are not a part of the graph. President Obama’s inadequate record on lands protection is even more conspicuous when compared to the amount of energy development recently approved on public lands. As seen in the graph below, this administration has leased approximately 2.5 times more land to oil and gas companies than it has permanently protected for the American people and future generations to use for recreation, clean air and water, and historical purposes. Energy development is an important use of our public lands and waters—in fact, 32 percent of the nation’s oil and 21 percent of its natural gas comes from them. And as the president stated, he is pursuing an “all of the above” approach to energy development on our public lands by encouraging the development of both fossil fuels and renewables on these lands. But a progressive public lands management strategy means that conservation must also be part of a balanced energy policy. And the graph above shows that land conservation and energy development on public lands have been very much out of balance under this administration. It is especially vital for the administration to take action to permanently protect our public lands because Congress has not recently done so. The 112th Congress, which just ended, was the first since 1966 to not designate any new wilderness areas, and the House of Representatives was last year termed “the most anti-environment House in the history of Congress.” Because party leadership remains much the same, there are few signs that this will change over the next Congress. 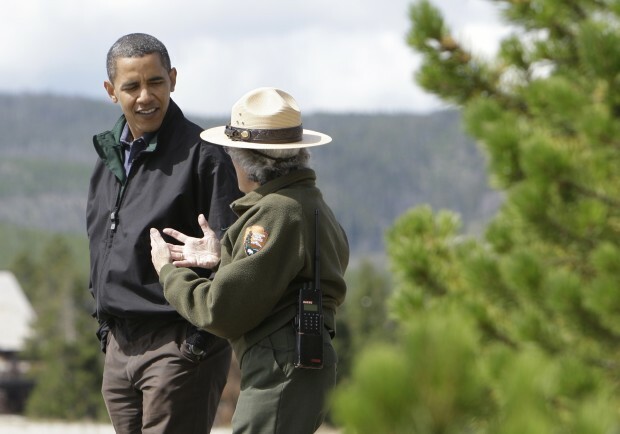 President Obama and his cabinet secretaries responsible for managing public lands have a serious opportunity to fill the shoes of their predecessors and establish their own conservation legacies. What remains to be seen is if and how they will make it happen. Jessica Goad is the Manager of Research and Outreach for American Progress’s Public Lands Project. Christy Goldfuss is the Public Lands Project Director.